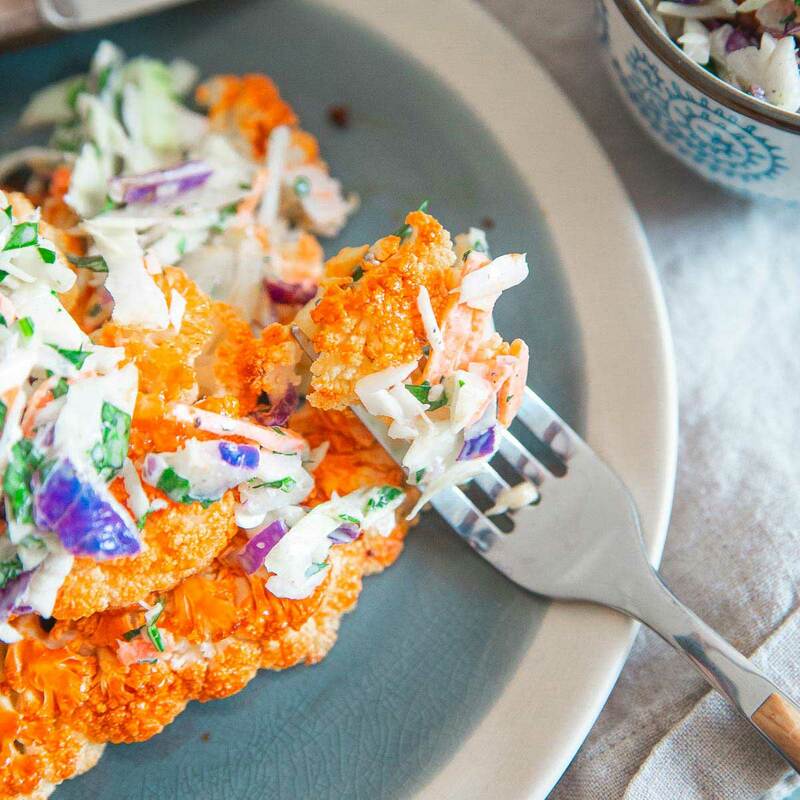 These roasted buffalo cauliflower steaks are topped with a creamy blue cheese coleslaw. Enjoy the flavor of buffalo sauce for game day with a healthy twist! Oh look, it’s that time of year again. Ugh. The biggest game day of my least favorite sport. But as I say every year, while I hate the game, I love the food. From hummus fundido dip to sweet potato guacamole bites and all things buffalo sauce, I will happily eat it all. I like a good saucy buffalo wing as much as anyone else out there. But, with a beach vacation to Mexico in about a week that poses a little bit of a dilemma. Buffalo cauliflower is the solution. How Do You Make Buffalo Cauliflower? 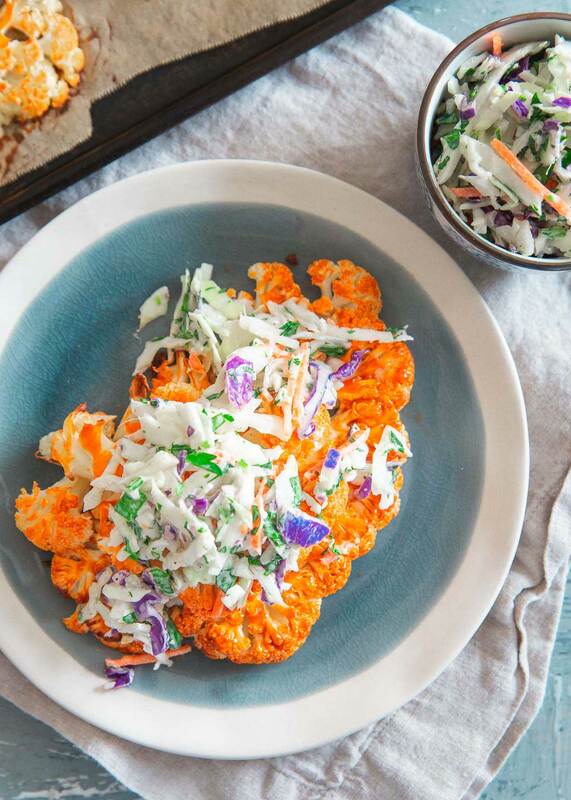 These roasted buffalo cauliflower steaks are even easier than buffalo wings. Want to know why? There’s no frying involved. There’s also no butter, just buffalo sauce. Kinda like a double whammy of healthy. Cauliflower > wings and buffalo sauce > butter. Cut cauliflower into steaks – I detail how to do this in the directions of the recipe below but you can also check out these bison cheddar cauliflower steaks for more info. Brush with buffalo sauce – make sure to brush both sides before they go into the oven for extra buffalo flavor! Roast – I like to use my convection roast setting for this as it does such a great job making roasted vegetables crispy but if you don’t have that setting, just increase the temperature (again, details in recipe instructions below) and roast normally. What Do I Do With the Rest of the Cauliflower? When you make cauliflower “steaks” you’ll inevitably end up with about 1/3 to 1/2 the cauliflower that sort of falls off into florets. 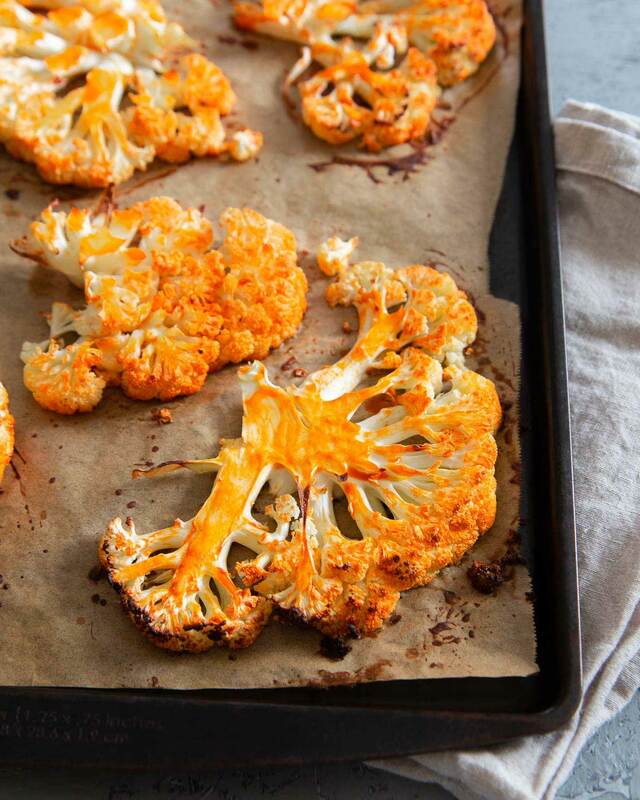 Those florets can be roasted and turned into buffalo cauliflower bites! Just toss the extra cauliflower with more buffalo sauce in a bowl. Spread out on another sheet pan and roast alongside the buffalo cauliflower steaks. Cauliflower bites taste just as good as cauliflower steaks! What Do I Serve With Buffalo Cauliflower? Just like a good buffalo wing needs some blue cheese for dipping (please don’t tell me you like ranch with your wings, it’s unacceptable), buffalo cauliflower needs a pairing too. Creamy blue cheese coleslaw is just the thing. Just mix that all up in a bowl and top the crispy roasted buffalo cauliflower when it comes out of the oven. It’s creamy and cooling in contrast to the hot and spicy buffalo flavor and near perfection. Don’t forget about the buffalo cauliflower bites you roasted up at the same time either! Try serving those with a dip like the avocado cream sauce in this buffalo chicken cheddar bites recipe or just straight into some blue cheese dressing! I know cauliflower has been replacing everything lately as the new “healthy” alternative. From rice (buffalo turkey cauliflower skillet), to gnocchi, to pizza crust (cauliflower pizza crust) and now wings, it’s kind of insane. And I’m not going to sit here telling you this buffalo sauce cauliflower is better than a chicken wing. It’s a lower calorie way to satisfy a buffalo craving and it’s an incredibly easy oven baked recipe. If you want chicken wings on Superbowl day, eat them. These apple butter honey mustard wings ones from my girl Brandy are insane. 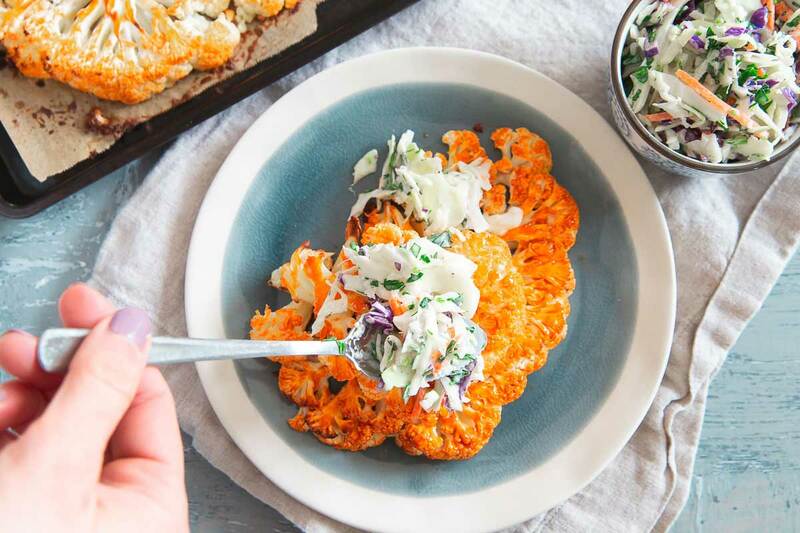 If you want to try something new that’s pretty delicious in its own way, give this buffalo cauliflower recipe a try. And if you want to check out even more buffalo sauce recipes, take a look at the recipes in this list below. Satisfy that buffalo craving with one of these buffalo sauce recipes. There's jerky, soup, nachos and more! 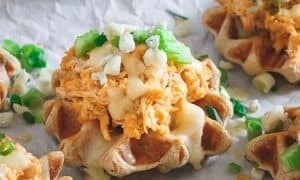 When waffles and chicken combine with buffalo sauce, it's a trifecta of deliciousness! Buffalo sauce flavor in jerky form! 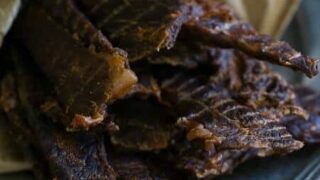 Make your own jerky with this delicious variation. 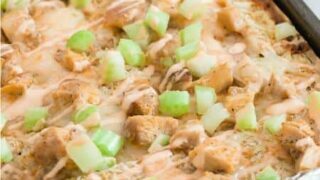 Create an easy buffalo themed nacho tray using Triscuits, celery and lots of delicious creamy buffalo sauce. 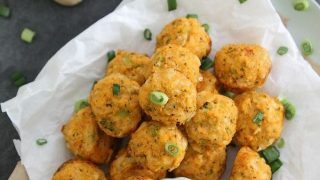 Pop back a few of these buffalo chicken broccoli cheddar bites while watching the game! 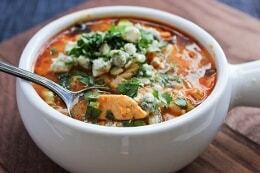 Cheesy, spicy, buffalo chicken soup with orzo is ready in just 30 minutes. You'll love this flavorful soup! 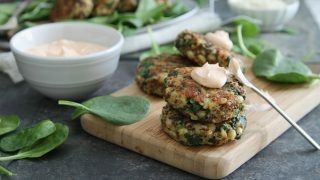 Hearty spinach cheddar cakes are delicious with this creamy buffalo dip. A healthy way to kick that buffalo craving. Slice the cauliflower from top down to the bottom/core in 1 inch slices. You should end up with 3-4 "steaks" from the center of the cauliflower. Roast for 20 minutes, carefully flipping half way through. 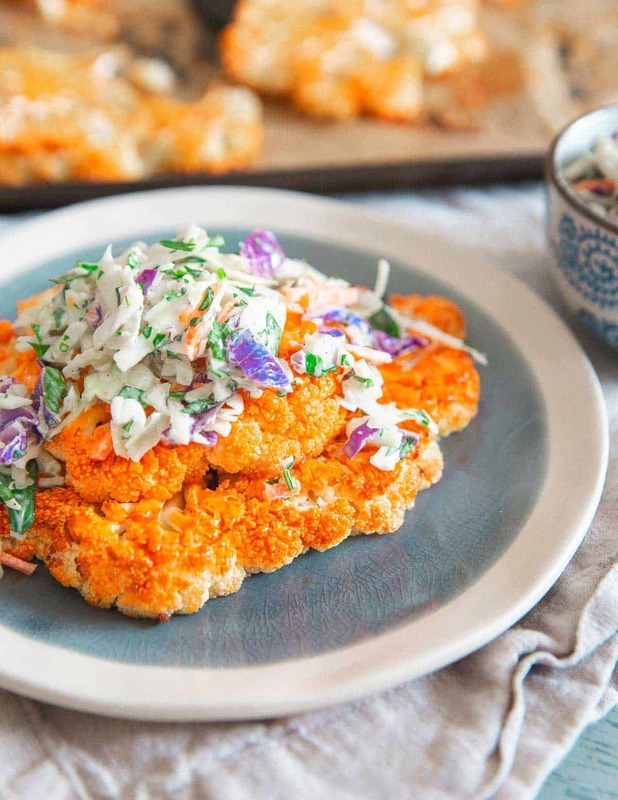 Transfer to a plate and serve with blue cheese coleslaw. *Use leftover cauliflower for another recipe or roast on another baking sheet with more buffalo sauce. They won't be "steaks" but they'll taste just as good! This dish is absolutely excellent! I usually just buy it. I think I had Texas Pete’s on hand when I made these.